With winter coming ever closer, I would suggest Wright Brothers opening raWBar is rather timely with oysters coming into their best eating. 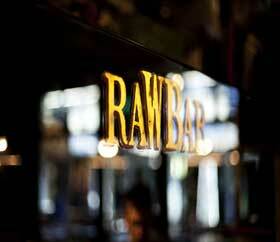 “On 21st October 2011, the raWBar opened to the public. Executive Chef David Gingell has created the raWBar menu. There is a selection of the Wright Brothers oysters straight from their Duchy Oyster Farm on the Helford River in Cornwall, the British Isles and France. Also dishes including sustainable Mottra caviar with brown toast & crème fraîche, market fish tartare (price available on the day), Cherrystone clams, and sea urchins with sourdough soldiers. The raWBar has a selection of artisan beers, and an extensive wine list incorporating a selection of natural, organic, bio dynamic and low intervention wines from Les Caves de Pyrènnes. The raWBar opens onto the courtyard at Kingly Court. The space has been designed by our Operations Manager Jeremie Cometto-Lingenheim, in collaboration with restaurant and bar designer, Benchmark. The raWBar includes a patinated zinc crustacea display with an aged Verano mirror, ribbed holophane Venetian glass lamps and Victorian tin-type photographs depicting portraits and curios.